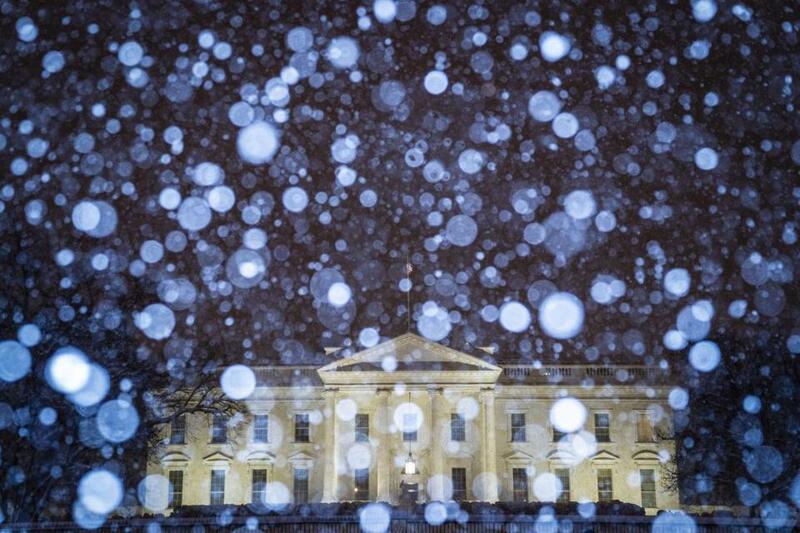 Snow fell at the White House on Jan. 13, a possible sign of a change in the polar vortex. The swirling winds tens of thousands of feet high in the sky above the Arctic — the dreaded polar vortex — broke apart into three parts to ring in 2019. Now the eastern half of the United States is about to feel the consequences. Weather models project the onset of a severe and punishing winter weather pattern in just over 10 days, with extreme cold and heightened storminess. In fact, the transition to this harsh winter pattern has likely already begun. Before and during the vortex disruption, locations east of the Rockies basked in unusually mild weather for weeks. Washington, D.C., witnessed 28 days of unusually warm weather, and the first half of January ranked among the top 10 warmest on record in Minneapolis and Milwaukee. But the polar vortex split, which forecasters predicted in December, has likely triggered a transition toward a much more wintry pattern. Even though the vortex split around the start of the New Year, it often takes weeks for the effects to become apparent in day-to-day weather. The vortex zips around the North Pole high in the stratosphere about twice as high up as commercial aircraft fly, so its downward propagation through the atmosphere is a drawn-out process. Last weekend’s storm, which dumped 10 inches of snow in both St. Louis and Washington, may have been one of the first indicators of the shift to harsher winter conditions. After the vortex fractures, it can fundamentally alter the flow in the atmosphere. Steering winds that blow from west to east — transporting mild air from the Pacific Ocean over the continental United States — shift to more north and south. Arctic air can more readily be drawn into North America and Europe. A blast of a bitter Arctic air is forecast to plunge into the eastern United States late this week and this weekend, the coldest of the winter so far in some areas — another possible sign of the vortex disruption. By Sunday, temperatures are forecast to be 10 to 25 degrees colder than normal in the central United States and parts of the East. Temperatures may plunge below zero in Kansas City on Sunday, where the AFC championship game between the Chiefs and the New England Patriots will be played. But this cold snap may still just be an appetizer. Computer models suggest the onset of persistent and acute cold may hold off until between Jan. 25 and 30. Meanwhile, temperatures may fluctuate wildly as this new, harsh regime becomes established. The signal for an extended period of cold and potentially stormy weather is very strong continuing well into February, long-range forecasters said. ‘‘I think you can be very confident,’’ Ventrice said. The American modeling system is in agreement with the European in forecasting the initiation of a very cold pattern in about two weeks. Once this wintry pattern becomes entrenched, it may be difficult to dislodge. ‘‘These impacts can last four to six, and maybe eight, weeks,’’ said Cohen, who expects the worst winter conditions in February. After last year’s polar vortex disruption in February, abnormally cold and stormy weather dominated the eastern United States in March and well into April. Because of the developing El Nino event, which adds moisture to storms traveling across the South, the snow potential will also be enhanced during this period. ‘‘We’re seeing all of these southern stream storms, which will act as seedlings for nor’easters,’’ Ventrice said. Ventrice said the cold should penetrate into the Deep South and winter will have worn out its welcome by the end of February.